"Lights, camera, action!" I don't know how authentic or prevalent that famous expression actually was (or is), but the film music on this disc clearly invokes images from a golden Hollywood era that featured exotic locales, swashbuckling heroism, tear-jerking romance, cliff-hanger endings, and the quite spirit of expectation and excitement those three words augur. Movie scores today, without doubt, offer less melody (and, let's face it, less music), more effects (thanks to synthesizers), and occupy a sonic perspective more in the soundtrack's background than those of the early- and mid-twentieth century. I'm not sure what the reason is for the diminishing role of music in films. Perhaps, in the past, the imposing likes of Korngold, Rózsa, Waxman, Herrmann, Steiner, North and many others bolstered the confidence of producers and directors enough to dispel whatever doubts might arise regarding the important role of music in their craft. In recent decades it is true that Williams, Morricone, Goldsmith, and a few others with genuine talent have made names for themselves – but so have Elfman, Horner, Ry Cooder, Grusin, Edelman, and many another lesser light. I must suggest, too, that emphasis on action in films today – noisy action – would seem to be a factor in the decline of the music score. However you might view the apparent diminution of the importance of music in films, you would surely second the notion that the movie industry of the 1940's and '50's was well served by a composer not usually mentioned as being in the front rank, but a composer who could easily stand with the best today, perhaps even with the best of his day. Hugo Friedhofer (1902-81) started out as a studio orchestrator in 1929. (Most orchestral scores you hear today are still ghost-orchestrated.) Eventually he got to compose scores on his own. His first, The Adventures of Marco Polo (1939), shows the work of an experienced and creative craftsman. The music, as presented in a thirteen-minute Suite reconstructed by conductor Stromberg, is exotic and tuneful, rhythmic and richly atmospheric. The Lodger, reconstructed and reorchestrated (Friedhofer's original score called for a small ensemble) by film composer John Morgan, is appropriately grim and creepy in the eleven cues presented here. I say "appropriately" because the subject of the film is Jack the Ripper. The Rains of Ranchipur (1955) and Seven Cities of Gold (1955), both restored by Morgan, again find the composer exotic and atmospheric. These two scores are chock full of attractive themes, some of folk origin, and both employ exotic instruments to clever effect, such as guiro, gourd and maraca. There are seven cues given for Ranchipur and twelve for Seven Cities. The main theme to Ranchipur is utterly beguiling in its mixture of eastern images and romance. This score, in fact, and The Lodger are the best of these four splendid creations, as far as I'm concerned. To give you an idea of Friedhofer's style, I would say his music is quite direct, very colorful and rhythmic, and brings to mind Korngold or a sort of exotic Richard Strauss. But The Lodger veers away from this description somewhat, clearly showing American influences, with hints of Hanson, Diamond, and Harris. 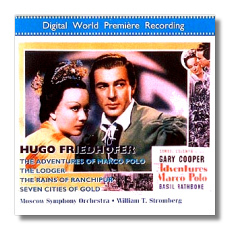 Stromberg and the Moscow Philharmonic Orchestra turn in marvelous renderings of these scores, and Marco Polo provides excellent sound and fine notes. These are première recordings and well worth the attention of those interested in film music.